Yay, we got cellulose insulation in one wall! Yup, only one. Last week we attempted to blow-in cellulose insulation into three walls of the main part of the house—the back extension we’re waiting on till we get a new heating system and ducting. Everything was going smoothly. First, they did the wall facing the sidewalk. Then in the afternoon they drilled tested holes in the front part of the house. From our office on the third floor we could hear them yelling, “Brick!” over and over. What?! Our house is built of bricks? So what do we do? Nothing. The only solution would be to remove all clapboards and the bricks so we could blow-in insulation. This process would be incredibly labor intensive and probably NOT worth it. With the one wall done I hope the house feels a bit warmer this winter. I’ve already notice the house is quieter and less street noise. But I do think once we get our fireplaces properly sealed, interior shutters installed and a new heating system the house will be just fine. Holes drilled to blow-in insulation. Testing the front of the house for insulation. 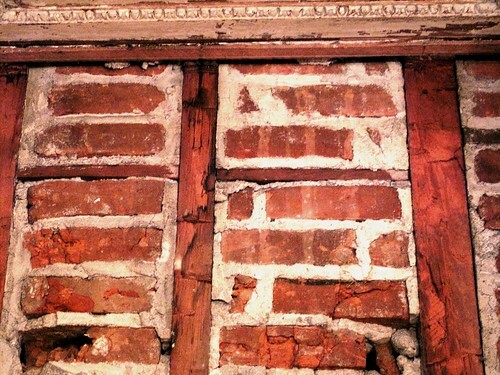 An example of brick nogging at Peter Augustus Jay House in Rye, New York via flickr. I’m A Real Homeowner: Backed Up Pipes, Again. My HVAC contractor had someone crawl under the front part of our 1830s house and install insulation batts up between the joists and cover the bare ground there with heavy plastic. The laid up stone cellar in the middle of the house was done the same way, only much easier since no crawling around in the dark was required. The back half of the house is too close to the ground for anyone to crawl around under so next spring we’ll pull up the floor boards and do it that way. We’ve had a moisture problem in our house because of this lack of protection. I’m really hoping we stay warmer and drier now, although I intend to keep on running my dehumidifier in the basement. Oh wow, that was a huge surprise, eh? Might be beneficial, and I agree too labor intensive to change it. Yup, we’ll have to wait and see Steve. I need to get interior shutters installed this fall. In terms of windows. Since I live in the historic district, I can only have single-pane true divide windows. Very interesting. I imagine it was a house of quality that went to such expense. My house had a similar treatment but it was made of lathe and plaster that was attached to the back of the sheathing before the interior walls were finished. Before I could blow in insulation, we opted to take off the sheathing and knock all of that out. It does add to labor and disposal costs but I figured while the outside of the house is ripped off, if I didn’t do it now, it would never get done. In the end, although I do notice some noise reduction, I don’t think the half I insulated is any warmer than the part old part. I think good windows make more of a difference. I had interior recessed shutters in my former place (1837 Greek Revival) and they did an amazing job of keeping out drafts in the wintertime. I have no idea why we didn’t find bricks on the other side of the house. Any guesses?? Wow, well I guess that is the adventure of an old house, making discoveries such as this! Seems like your house should be really sturdy though with brick inside the walls! Hope the insulation you were able to install helps you have a warmer winter, sounds like its already an improvement with the street noise, etc. I wonder why there wasnt brick on that side of the house? But then I would loose my lovely horsehair plaster walls. I think we’ll be fine but thanks for the tip Olga. Nope, the house has always had clapboards. In the third photo in the link above the clapboards were covered over with asphalt shingles. They’ve since been removed. On the inner wall we still have this scenario. On top are asphalt shingles, then clapboards, and then bricks in the cavity between the timbers. The old photo you have of the house under the “about” section of the blog is very small and hard to see, but it doesn’t look like clapboards? It looks smooth, like brick or stucco. So interesting! I’ll e-mail you directly about costs. But everyone should look into town and state energy credits for insulation. We ended up getting a town deduction. do you mind me asking what you were bid for the project? we’re this close to pulling the trigger on blown insulation for our old house but after a summer of renovations, i tremble at the cost.